"Ethics in Research on Children & Youths"
"Social Science & Humanities Research Ethics"
“A University Wide Model for the Ethical Review of Human Subjects Research” Research Ethics Review 1(2): 39-44. "Conflict of interest in research, education and patient care", Trudo Lemmens, Peter A. Singer, CMAJ 1998;159:960-5. "Continuing review of approved research by Canadian Research Ethics Boards". Weijer C. Canadian Medical Association Journal 2001, 164: 1305-1308. "The ethical analysis of risk." Weijer C. Journal of Law, Medicine & Ethics 2000, 28: 344-361. "The ethics wars: disputes over international research." Weijer C, Anderson JA. Hastings Center Report 2001, 31(3): 18-20. Research ethics (Bioethics for clinicians 10) by Weijer C, Dickens B, Meslin E. Canadian Medical Association Journal 1997; 156: 1153-1157. "Why clinical equipoise, and not the uncertainty principle, is the moral underpinning of the RCT". 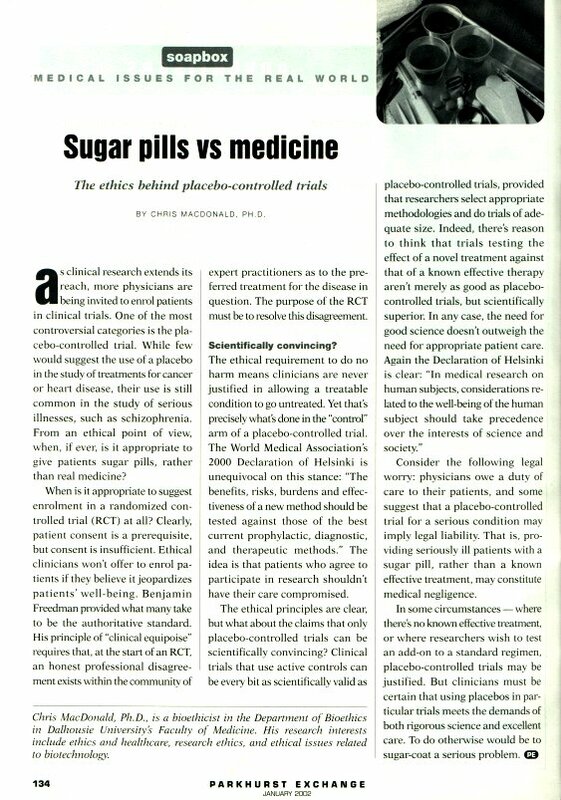 Weijer C, Glass KC, Shapiro S. British Medical Journal 2000; 321: 756-758.